EVERY animal is worthy of human compassion, and wolves are no exception. When a severely injured wolf was plucked out of the icy waters near Limentra, he was in a state of severe hypothermia and on the brink of death. The animal was severly malnourished, and his hind limbs were paralyzed from the cold. The caring rescuers thought they may have arrived too late, as his heart stopped after being pulled out of the river. His kind hearted rescuers refused to give up and continued to try to revive the creature. After a stressful few minutes, they successfully got the poor guy breathing again. When vets started diagnosing his injuries, that they found shocked them. They found that his body was riddled with 35 lead pellets, as the poor animal had been shot multiple times. Despite being near death, he received two weeks of 24/7 intensive care, the wolf was miraculously able to walk again. I LOVE seeing people really go the extra mile for an animal in need. Bravo to these brave and kind souls, and the dedication they put into reviving this majestic beast! 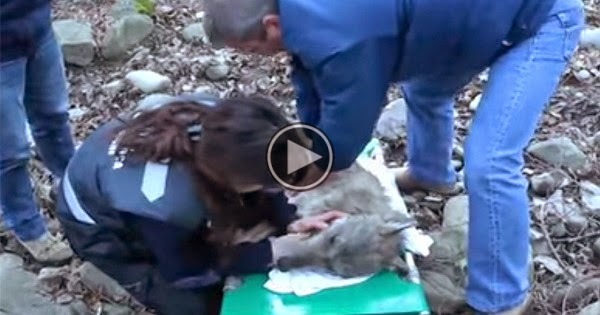 Be sure to SHARE this remarkable rescue with your friends on Facebook!